The Best Twitter Marketing blogs from thousands of Marketing blogs in our index using search and social metrics. Also see top Social Networking blogs list. Houston, Texas About Blog Twitter Coach teaching you to work smarter not harder. Facebook fans n/a. Twitter followers 63,732. Barrie, Ontario About Blog Check out Twitter Tools and Twitter Tips Blog to discover powerful tips and tools to take your Twitter brand to the next level. Facebook fans n/a. Twitter followers 439,508. Chicago, IL, USA About Blog Sprout Social provides marketing professionals with the latest Twitter tips and guides in the social media world. Facebook fans 65,778. Twitter followers 86,111. About Blog Marketing Land's guide to all things Twitter. Read the latest news about Twitter features including company news, hashtags, user feature updates and paid advertising products that marketers need to know. Facebook fans 170,139. Twitter followers 184,002. Facebook fans 496,764. Twitter followers 474,532. About Blog We'll help kickstart your #SocialMedia. From initial kickstarts, to full exposure. Facebook fans n/a. Twitter followers 96,830. Paris - San Francisco About Blog Agorapulse is an affordable, easy-to-use social media management tool that allows businesses and agencies to effortlessly manage their social accounts. Facebook fans 52,652. Twitter followers 5,587. About Blog Twitter Marketing Tips by Twtdominator. Facebook fans 19,390. Twitter followers 24. San Francisco, CA About Blog Twitter is one of the best ways to have your product or service go viral This sub discusses the best strategies for marketing on twitter. Facebook fans 1,131,970. Twitter followers 497,248. San Francisco, CA, US About Blog Read the latest writing about Twitter Marketing. Every day, thousands of voices read, write, and share important stories on Medium about Twitter Marketing. Facebook fans 286,091. Twitter followers 2,255,863. About Blog Discover the best Twitter articles in our Tips, Advice And Tools section and All the essential information from the Microblogging network. Facebook fans 136,813. Twitter followers 18,345. Los Angeles, CA About Blog Rock your online presence with social media graphics! Get Graphic Design & Social Media Marketing tips from an expert. Facebook fans 2,857. Twitter followers 7,055. UK About Blog Insights and advice on Twitter marketing strategies to help marketing professionals and agencies manage effective Twitter marketing campaigns. Facebook fans 4,015. Twitter followers 206,832. Sydney, Australia About Blog Tips and tactics on building a Twitter following, engaging with influencers, and making the most of the growing feature set of the world’s real-time newsfeed. Facebook fans 42,389. Twitter followers 547,193. Facebook fans 293. Twitter followers 241,961. Facebook fans 13,505. Twitter followers 45,840. About Blog Content, Social and Online Marketing Blog. Jonathan and Susanna telling you about Social Media Marketing and how to get more out of it. Facebook fans 2,269. Twitter followers 99,236. Indianapolis, IN About Blog Twitter Marketing applications, products, services, best practices and news for marketers at the Marketing Technology Blog. Facebook fans 8,130. Twitter followers 33,767. India About Blog DigitalGYD is a social media marketing blog focusing on Social Media Strategies and branding tips for small business owners. How to Start your own money making blog. Facebook fans 974. Twitter followers 4,372. Facebook fans 9,793. Twitter followers 25,333. Facebook fans 81. Twitter followers 1,317. Facebook fans 225. Twitter followers 3,867. 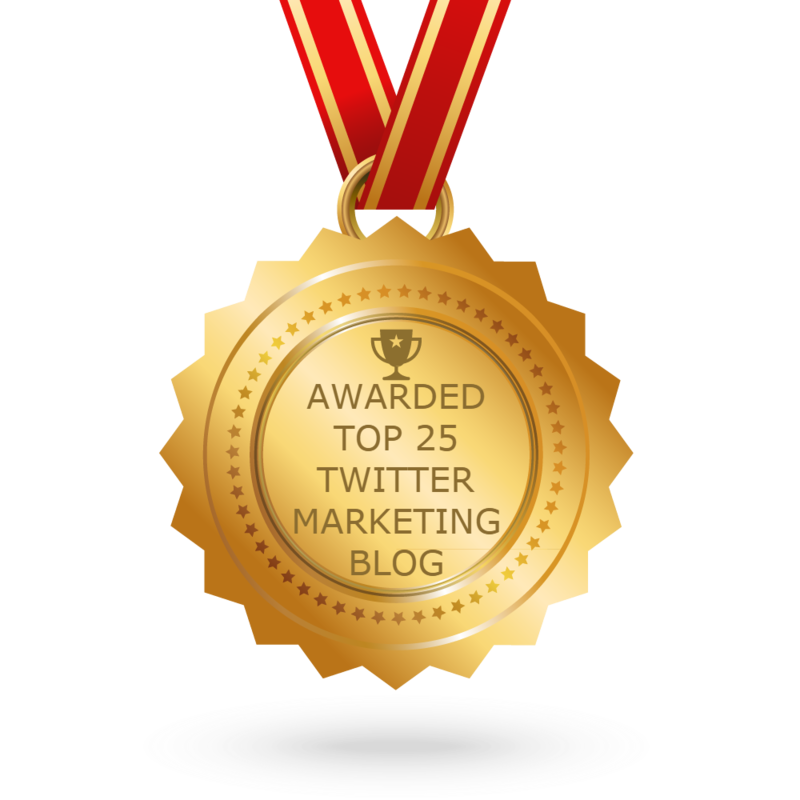 CONGRATULATIONS to every blogger that has made this Top Twitter Marketing Blogs list! This is the most comprehensive list of best Twitter Marketing blogs on the internet and I’m honoured to have you as part of this! I personally give you a high-five and want to thank you for your contribution to this world.